Whether you're a turtle laying your egg or a tourist on vacation, the beaches of Costa Rica are a beautiful place to visit this time of year. Every year, hundreds of thousands of olive ridley sea turtles arrive at a four-mile stretch of the Ostional Wildlife Refuge in Guanacasteto to lay their eggs. Although turtles lay their eggs here throughout the entire year, September and October are particularly active months. Unfortunately, this year's peak season has been disrupted by tourists who don't seem to realize the detrimental effects their mere presence has on the turtles. When arriving at the crowded beach this year, many turtles turned around, swimming back to the ocean without laying a single egg, the Tico Times reported. People stood on nests, touched the turtles and even took pictures of their kids riding turtles. "Turtles are very sensitive," local marine conservationist Jonathon Miller-Weisberger told the Waking Times. "As both tourists and the communities that live near nesting populations of marine turtles realize that these creatures are rapidly dwindling in numbers, they must learn to change their ways about how they interact with and care for them." Only visitors with tour guides are allowed on the beach, but rangers have been unable to keep others from sneaking in. A refuge administrator said that the refuge will coordinate with local officials and leaders to figure out a better plan for securing the beach. 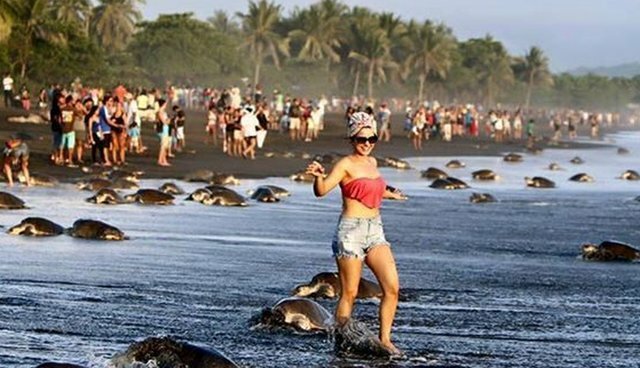 The refuge hopes their efforts will allow the endangered species to continue to use the beach as a place where they feel comfortable to give birth, bringing more of their kind into the world. If you're interested in watching these sea turtles nest their eggs, follow the refuge's Facebook page. There, you'll be able to observe the nesting without disrupting the turtles. Click here to learn more about conservation efforts to protect the turtles.